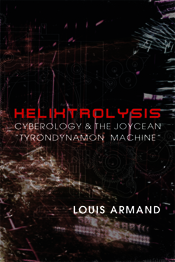 Cyberology & the Joycean "Tyrondynamon Machine"
! Currently out of Stock ! It is an intriguing feature of cybernetics, cognitive science, psychoanalysis, critical theory & particle physics that at key moments in their recent evolution their major practitioners have turned to the work of one particular "experimentalist" writer, James Joyce, in whose key works -- Ulysses & Finnegans Wake -- they have sought an articulation of the emergent virtuo-real universe which since the mid-20th century we have increasingly come to inhabit. From these two books have directly been drawn the name for the fundamental constituent of the nucleon (Murray Gell-Mann's quark), a new model of cognition (Daniel Dennett's Joycean machine), a radical cybernetic conception of language (Jacques Derrida's Joyceware), a psycho-analytical paradigm (Jacques Lacan's sinthome), & the foundations of post-War media theory (Marshall McLuhan's Gutenberg Galaxy, originally called The Road to Finnegans Wake). This volume examines a series of counter arguments to the conventional account of literary cybernetics in light of developments which have accompanied the encounter between critical theory and cultural studies, namely 'hypertextuality' and 'posthumanism.' In each instance, the continuing legacy of Joyce's works is examined in detail. Louis Armand is director of the Centre for Critical & Cultural Theory in the Philosophy Faculty of Charles University, Prague. His books include Solicitations: Essays on Criticism & Culture; Techne: James Joyce, Hypertext & Technology; and Incendiary Devices: Discourses of the Other.